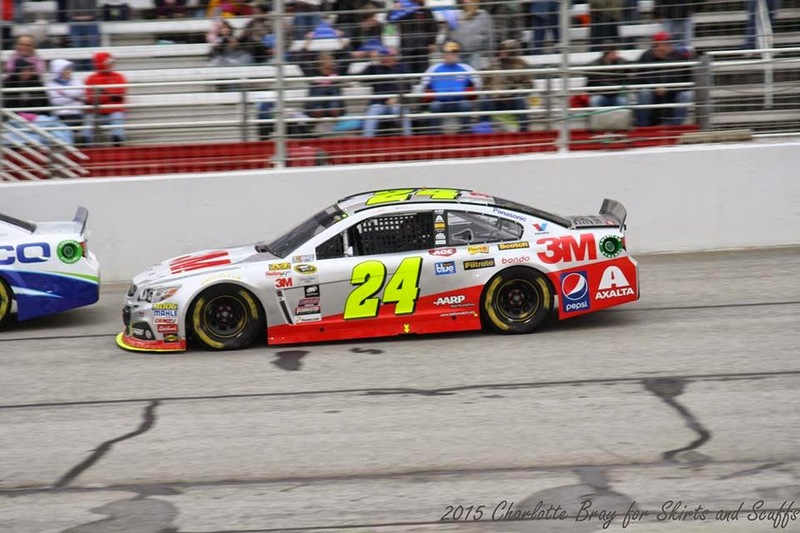 Jeff Gordon on track at Atlanta before his crash into the inside wall, Mar. 1, 2015. The long-standing nickname “Hotlanta” was passé this year as fans endured chilly rain and cool temperatures while drivers bundled up in coats on pit road. Although a few engines ran hot at the 1.5-mile track, perhaps “Hitlanta” might be a better name for the 2015 race weekend. First, Travis Kvapil’s No. 44 team took a big hit when thieves stole their Sprint Cup car from the hotel parking lot. On Friday morning, Denny Hamlin was jolted from sleep by a thunderous bang when an SUV rolled down a grade, hitting the side of his motorcoach. Were there more hits? Oh yeah. Fourteen teams took hits when their cars missed qualifying due to tech inspection issues. And the nastiest hit of the weekend was sustained by four-time champ Jeff Gordon, when his car slammed left-nose-first into the infield wall -- a concrete one, not one with a SAFER Barrier -- just like Kyle Busch at Daytona the previous week. NASCAR drivers don’t have SAFER barriers on every wall, at every track on the circuit...yet. But if you’re a child of God, you have impact-absorbing protection everywhere you go. Even when the “big hits” come in your life, God has His protective arms under and around you, offering comfort. Life is full of hits that feel like concrete walls. Some knock the wind out of us with a full force impact, while others just scrape us up a little bit. But even though God is always there, sometimes we can’t feel His presence or He seems silent. But that’s now how it works. God never promised to make our lives easy and remove our pain on command. If I’m not feeling His presence and comfort, it’s usually because I’m not seeking Him. To my embarrassment, my prayers can mimic a gal asking a genie for her promised wishes. But that’s not how I want to approach my Heavenly Father. I need to keep praying, but pair it with reading my Bible. Reading with an open heart is a way to seek God’s guidance, because He often speaks through scripture verses. Guidance sometimes comes as a deep-down peace as I read. As I keep praying and reading, there’s one more thing I need to remember, and maybe you do, too. When a nasty hit flings us into a concrete wall, instead of dwelling on the negatives, we can choose to look for the blessings surrounding the situation. Even when that hit hurt us physically or emotionally, and we have a long, difficult road ahead of us, there will be positives along the way. In life you can choose to focus on the negative or the positive. I choose the positive! I have an amazing husband, a baby kicking in my belly and wonderful family, friends and fans who offer us such encouragement and support. I thank God for these things daily and continue to pray for a speedy recovery for Kyle. “Faith on the Frontstretch” explores the role of faith in motorsports and runs every 1st & 3rd Wednesday of the NASCAR season. Follow Beth on twitter at @bbreinke. Want more racing devotions? When you donate $25 to Skirts and Scuffs, we’ll send you a complimentary copy of Beth’s book, Race Fans’ Devotions to Go, a month-long, pocket-sized devotional book for NASCAR fans. Or you can purchase the book in paperback & ebook here.